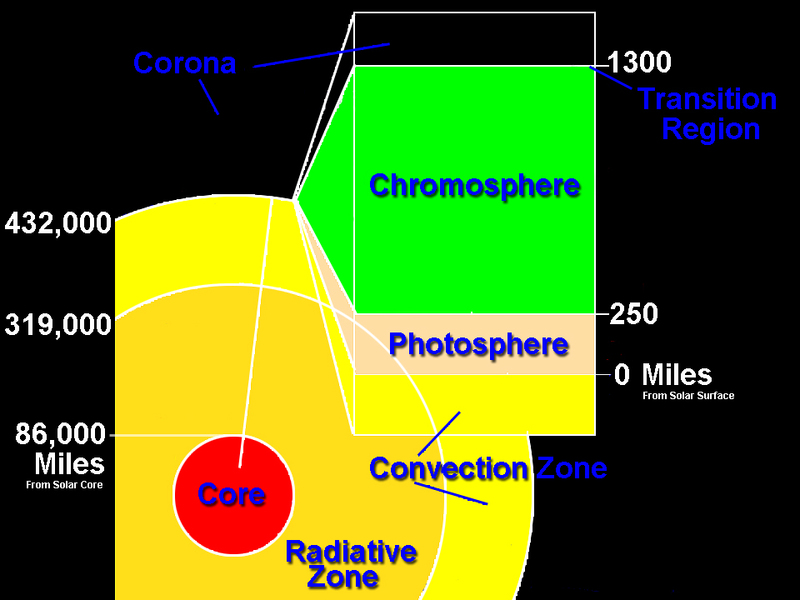 This graphic shows the layers of the Sun, with ranges for each layer: for the inner layers, the mileage is from the sun’s core; for the outer layers, the mileage is from the sun’s surface. Photosphere – The photosphere is the deepest layer of the Sun that we can observe directly. It reaches from the surface visible at the center of the solar disk to about 250 miles (400 km) above that. The temperature in the photosphere varies between about 6500 K at the bottom and 4000 K at the top (11,000 and 6700 degrees F, 6200 and 3700 degrees C). Most of the photosphere is covered by granulation. Chromosphere – The chromosphere is a layer in the Sun between about 250 miles (400 km) and 1300 miles (2100 km) above the solar surface (the photosphere). The temperature in the chromosphere varies between about 4000 K at the bottom (the so-called temperature minimum) and 8000 K at the top (6700 and 14,000 degrees F, 3700 and 7700 degrees C). So in this layer (and higher layers) it actually gets hotter if you go further away from the Sun, unlike in the lower layers, where it gets hotter if you go closer to the center of the Sun.Transition Region – The transition region is a very narrow (60 miles / 100 km) layer between the chromosphere and the corona where the temperature rises abruptly from about 8000 to about 500,000 K (14,000 to 900,000 degrees F, 7700 to 500,000 degrees C).